The Rhino design puts the bore axis much lower in the hand, resulting in a significant reduction in muzzle rise, even with magnum rounds. The bore of a revolver sits high off the hand, and because of that the muzzle flip during firing has always been quite pronounced, especially with magnum loads. That's just physics, leverage and force. Traditionally the barrel of a revolver is lined up with the top chamber in the cylinder, which puts it far above the user's hand. What Chiappa (pronounced key-apa) has done with the Rhino is put the barrel in line with the bottom chamber in the cylinder. Not only does this drastically lower the bore, because of the rearrangement of the internal parts, the grip itself—available in black rubber or wood laminate—can be put higher on the frame of the gun. The Rhino is not the first revolver with a bottom-chamber barrel design. In 1997 we saw the introduction of the Mateba Model 6 Unica, an "autorevolver" designed by Emilio Ghisoni. If the Mateba looks like a more complicated cousin of the Rhino, that's because Ghisoni helped design the Rhino as well. Just moving the barrel down the width of the cylinder required a complete internal redesign, and the Rhino has more parts than a traditional double-action revolver. What appears to be the hammer is actually the hammer's cocking lever; the hammer is set way down in the frame. At the top rear of the frame is a small red plunger that protrudes when the unseen hammer is cocked. The cylinder can't be opened when the hammer is cocked, and to uncock the gun the procedure is the same as on any other double-action revolver: Carefully hold back the cocking lever, pull the trigger and then slowly lower the hammer by use of the hammer cocking lever. Given all this, it should come as no surprise that the two-inch-barreled Rhino 200DS I tested is a unique-looking piece. A six-shot .357 Magnum, the Rhino sports a flat-sided cylinder to aid in concealment. There is a square notch milled into the frame for the rear sight, and the front is a serrated ramp pinned into place. The cylinder release is a lever on the left side of the frame that rotates downward under your thumb. Between the lower bore and the higher grip, muzzle rise out of the two-inch Rhino when shooting .38 Specials is akin to shooting a .22. I'm not kidding; there is almost no muzzle rise with Specials. With .357 Magnums, muzzle rise isn't much more, although you can hear and feel the difference, especially in the palm of your hand. The revolver still recoils, but the recoil forces are almost all straight back, as with a semiauto. Trigger pull on my test sample was the same as on the numerous other Rhinos I have fired: excellent. The double-action pull was just under nine pounds, and could be staged just before breaking for precise work. The single-action pull was four pounds, with no take-up or overtravel. The trigger is wide and smooth, just how I like it. Even though it has a short two-inch barrel and lightweight aluminum frame, because of its size this is not a pocket gun. Chiappa provides a leather pancake belt holster with the pistol. The Rhino's design requires more parts than a traditional double-action revolver. How durable is it? Time will tell. 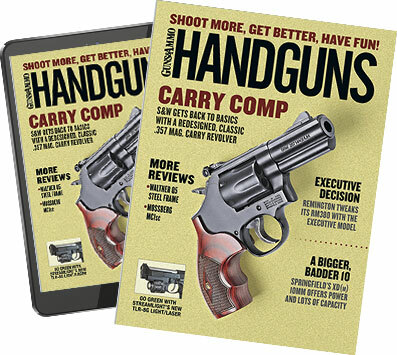 I have shot three different Rhino 200DS revolvers extensively—one at an industry event, one for this article, and one during the filming of the Handguns TV show. I managed to "break" one of them (specifically an internal spring fell out of place) while filming the TV show, but all the others I've shot or seen used ran flawlessly. My first handgun was a .357 Magnum S&W 586. I learned right away that shooting magnums is not fun or enjoyable, due to both blast and recoil, and the S&W Model 10 I have at home is loaded with .38 Specials, because my philosophy is that hitting with a Special is better than flinching and missing with a Magnum. The Rhino is the first carry-size revolver I've shot that I would load with .357s and not worry at all about recoil. An underbarrel revolver is an idea long overdue, and designs like the Rhino are the future of revolvers. Smallest avg. group: 158 gr. Hornady XTP .38 Spl.—2.6 in. Largest avg. group: 110 gr Hornady Critical Defense .38 Spl.—3.0 in. Avg. of all ammo tested (4 types): 2.8 in. Accuracy results are the averages of four five-shot groups at 25 yards from a sandbag rest.